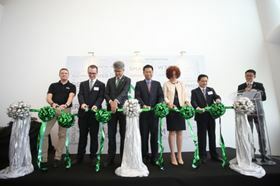 Cutting the ribbon at Mann+Hummel's new Internet-of-Things Lab in Singapore. The lab is an integral part of Mann+Hummel’s research and development blueprint to develop and deliver smart filtration technologies. “The lab in Singapore will be our new Global Center of Competence for IoT solutions. We will harness our understanding of the filtration industry and the needs of our vast customer base and build optimized smart solutions with advanced sensors and predictive capabilities,” said Thomas Fischer, chairman of Mann+Hummel’s supervisory board. “Establishing the lab in Asia especially in Singapore will allow for the acceleration and adoption of these new technologies to take place,” added Fischer. “We will build a business model by putting the customer first and then select the right IoT concepts to bring innovative value propositions to our end users,” said Nicolas Payen, director of the Mann+Hummel IoT lab. The lab, which will hire system, hardware, firmware and software engineers as well as data scientists, is actively working on more than ten innovation projects with another 30 in the pipeline.